M. Chervotkin created this painting, entitled "Nobody Wanted to Die." It is part of the collection "Holodomor; Through the Eyes of Ukrainian Artists," initiated by Founder/Trustee E. Morgan Williams. The image is online via Holdomor Research & Education Consortium. As the grain situation in Ukraine worsens, the people continue to starve. Some are forced to eat their dogs. Others use weeds, wheat chaff and dried nettle leaves (among other unlikely ingredients) to make what the people call a "weed loaf." Alexander Wienerberger also observes, firsthand, what is happening in Kharkiv. 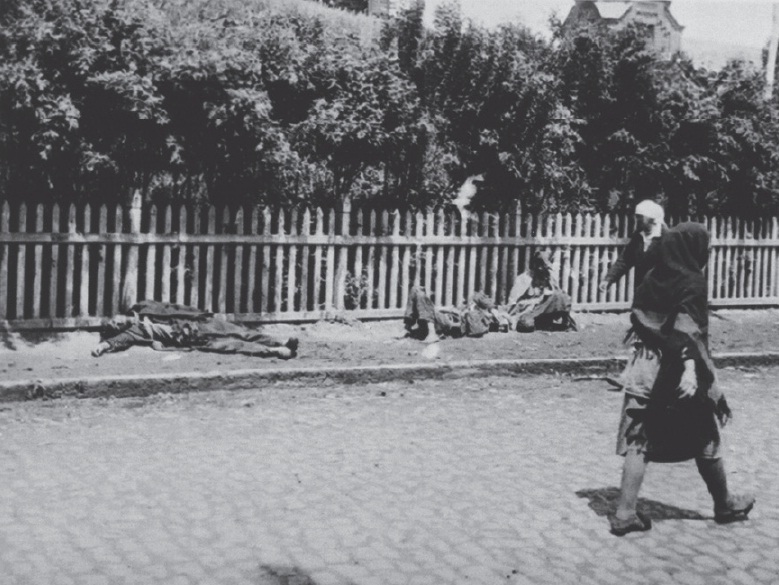 A German national, working in the Ukrainian capital, Wienerberger secretly takes pictures of what he sees (despite the government-imposed ban against picture-taking of famine-related events). Hungry, or dying, people are falling on the city's sidewalks. At a grain conference in London, Soviet officials seek to raise their exports significantly. By suggesting that the country has so much grain it can export more and more, Soviet officials succeed in duping governments in Europe. Who would believe that the Soviets were able to ship all that grain because they were starving their own people? Indignant over worsening conditions, in their own countries, international Socialists rally to support the Soviets against the starvation rumors. Some visitors are given tours—including in Ukraine—and report that everything seems fine to them. They do not realize, however, that their trips are stage-managed, and they have also been duped. Kiev, and its surroundings, seem fine only because the government has carried-out a charade. Soviet propaganda, including film production, assures city viewers that all is well in the farming world. People in Moscow watch idealized scenes, in Soviet theaters, while the famine in Ukraine rages on. One cannot say that people ignore suffering when they know nothing about it. Show trials begin in Moscow on trumped-up charges against six British engineers working in the Soviet Union for Metropolitan-Vickers Electrical Company. Members of the foreign press corps are allowed into the trials on the condition that they mention nothing about the famine. Keen to report on the trials, and the six defendants, most of the press takes the bait. But not every reporter takes the bait. Malcolm Muggeridge, a British correspondent, is one of the few foreign journalists who defy the demands of Soviet officials. Arriving in the Soviet Union, during 1932, Muggeridge does his best to report the actual conditions he observes (which is far from the stage-managed scenes observed by foreign government officials who tour where Soviet officials want them to go). Muggeridge sends his articles with diplomatic dispatches, to make sure they can actually get out of the country. He leaves Soviet-controlled territory before the articles are published. Bos, Carole "Ukrainians Die from Hunger" AwesomeStories.com. Feb 23, 2017. Apr 24, 2019.